There was a scare Monday on Logan Street at Lampton Street as a few bricks fell from a tall ice warehouse structure. The city blocked off the street for safety and sent out inspectors to take a look at the damage. We know from history that falling bricks and inspectors don’t get along and many a repairable building has been lost for the lack of maintenance. Luckily, this building is solid concrete with a brick veneer, so demolition seemed unlikely. A few years ago, this complex of historic structures once housing the Shaefer-Meyer Brewing Company and then the Fehr Brewing Company and then the Merchants’ Ice & Cold Storage Company was the target of a redevelopment effort dubbed the Louisville Lofts. The grand scheme once set to open in 2006 envisioned a mix of retail and residential in the tower and adjacent buildings, but sadly was placed on hold. Developer Gary Bates says he and his business partner George Breathitt are meeting with masons to determine the cost of repair to the brick facade so the property can be redeveloped in the future. Bates says the building’s structure is in solid condition and demolition is not in his plans. From this week’s spill, however, it’s apparent that there are still some dangers to overcome. The good news is that the building will see some needed maintenance and Bates says a new proposal for the property is being finalized that could potentially bring new construction as well as renovation of the historic structures. Details aren’t ready to be released, though. The complex is steeped in history and operated as a brewery continuously from 1881 through 1919 when it was forced to end production due to prohibition. 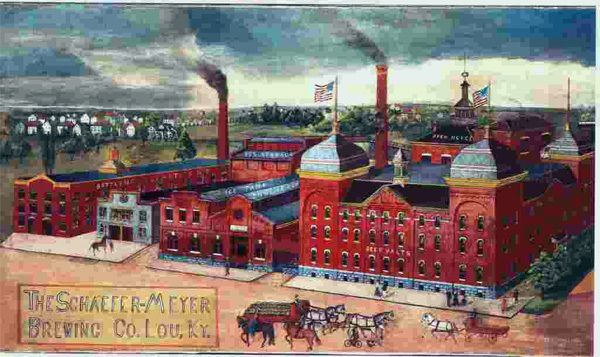 Beer production reached 50,000 barrels a year in 1901 and the Schaefer-Meyer Brewery combined with several other companies under the name Central Consumer Company and began producing Fehr beer. A rendering of the facility from 1906 is below. To adapt to the changing times, the business changed to cold-storage and ice production in 1920 and the 13-story tower was built the same year. Three of the original brewery buildings remain today on the site dating from 1890 to 1905. Check out some historic construction photos of the tower here and here and here and here and here. You can see the original appearance of the corner building was altered to match the tower including the removal of the signature onion-top roofs and tall weathervanes. If you look closely at the Lampton Street side of the structure today, though, it’s clear that the brick facade is in fact from the original building although the windows have been bricked in and other details obscured. In the 1980s, a portion of brick wall housing the beer vaults failed and the wall was replaced with concrete. Inside the extant buildings, cast iron columns remain and one four-story structure, the Brew House, still retains an ornate cast iron staircase. The Brew House cupola was removed at some point, too. Interiors are generally industrial in nature and do not contain ornate detailing. It’s clear from the tower addition how attitudes of scale, context, and preservation have changed through time. The 1920s-era structure ignores the style and scale of surrounding buildings and instead opts for a design inspired by art-deco and Beaux-Arts motifs. 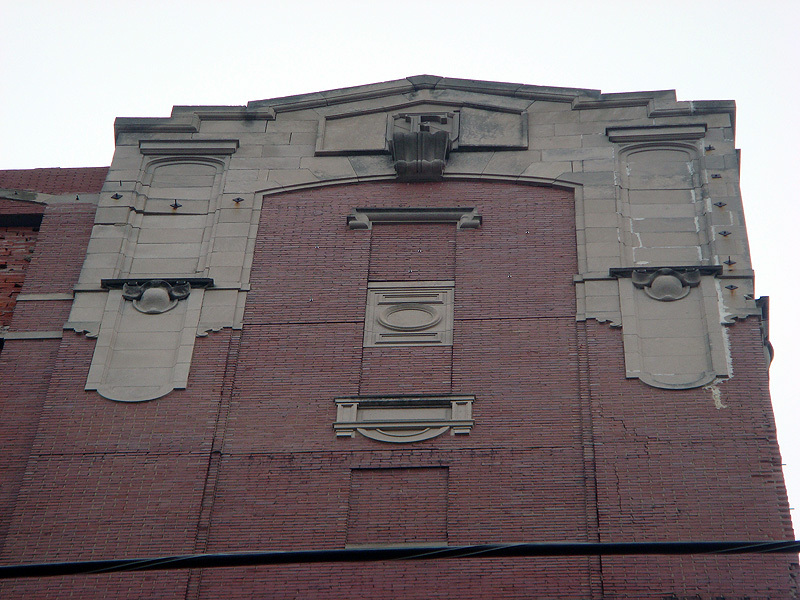 The original tower had no windows although the facade has been changed for the proposed Louisville Lofts and to address safety concerns of crumbling brick. Louisville has a long a storied brewing heritage that I can’t get into here, but the Schaefer-Meyer complex comprises a major part of the story and represents one of the only brewery structures left in the city. I have always been fascinated by these buildings and Louisville’s brewing history. Hope to see something constructive done with the buildings that remain at this site. Always appreciate entries like this. All the bricks are now gone off the east, south, and west sides. The building at the northwest corner is partially collapsed. The street is still closed. It looks to me like they’re going to bring it down. @Alan – Curiosity led me to drive by the site to see if it is still there. It is, but the damage you describe is still there as well. The “public” sides of the ice tower have been completely stripped of all the exterior brick and stonework. Part of Logan Street wall of the corner building is gone as well, but the opening was surrounded by scaffolding and didn’t look to have been collapsed. However, there is still a good chance that this may simply be a demolition that penniless owners are having to move at a painfully slow pace. I would hope though, that the brick work has merely been removed and stored until the building can be renovated. Curious to know since the BS is active once again if anyone has information regarding this possible development? This area of town like so many other places has a lot of potential.